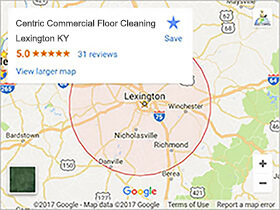 Hiring us for your commercial cleaning services in Lexington KY, Georgetown, Richmond, Frankfort, Winchester, or Nicholasville is a great choice. Our work will have a good effect on the way your customers and employees see your business. It’s said that you get one chance to make a first impression and we can help you put your best foot forward. What Separates Us From All of the Other Commercial Cleaning Services? We have full commercial cleaning services. When you call us in we can and do clean every thing in your business that needs it in one go. We’re not limited in the least so there’s no need to have a service do your carpets, then another company service your floors. 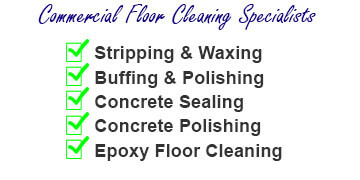 We truly are a one stop shop for all commercial cleaning needs. We know that no two companies have the same commercial cleaning needs. We have pricing that’s very fair and we can offer you great service at the best price. It doesn’t matter if you need a light once over, or a deep cleaning through out your whole business. We’re equipped so that we can do all jobs, and all clients needs large and small. What Types of Facilities Do We Clean? How Does the Commercial Cleaning Process Start? It’s simple! Just place a call to our office at 859-396-1718 or use our CONTACT US FORM. We will set a time that’s best for you and quote you a fair for your commercial cleaning services. It’s just that easy so call today and we’ll get started for you. 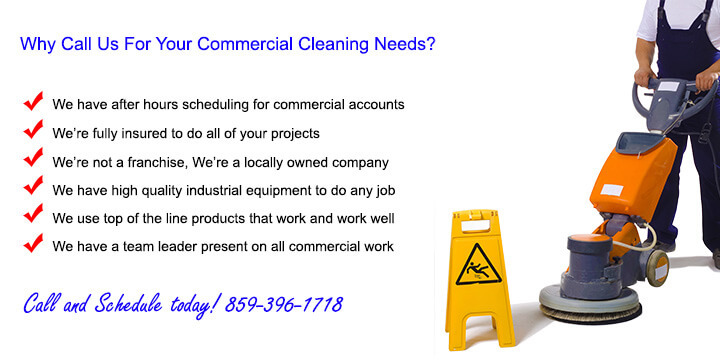 To learn more about commercial cleaning visit the IJCSA website.